Running the sub from speaker level outs has disadvantages. 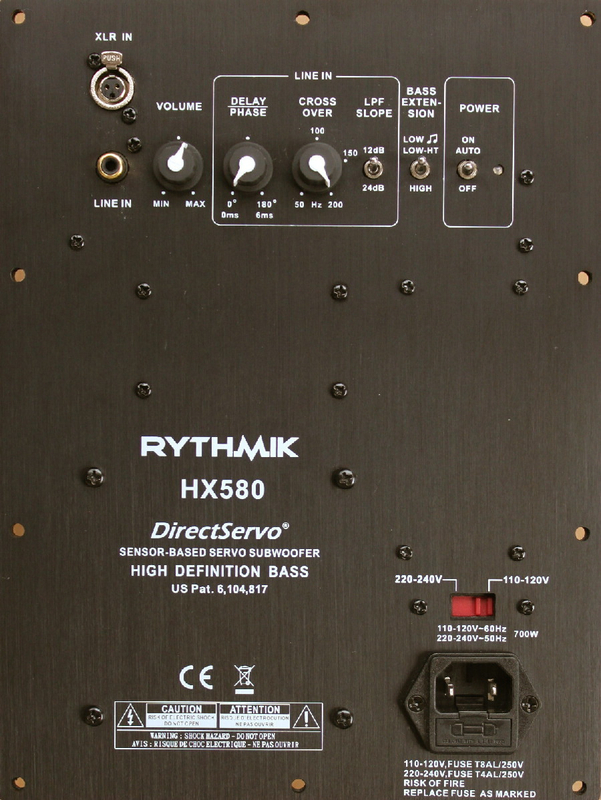 Mains are not filtered, and the result is higher distortion on deep bass at any level approaching very loud. The best thing we did was to filter our mains at about 80Hz, it added clarity, took the load off the small woofers and they seemed cleaner for sure at high levels. Most all Polk mains simply can not handle really loud deep bass at high levels, when compared to a decent true sub. I think in some rooms, having a preamp that has a high pass crossover, like the Parasound P6 for example, mated with DSP room correction for the subs offers the best tools to help integrate a sub/subs to a set of speakers and room. What you're going to do is not exactly the same as what I wrote. Are you sure your Rythmik doesn't have speaker level connecrions? Any RCA or XLR cable will work. That said... seems like the ultra-high damping factor crowd would have issues with using high-level (power amplifier level) outputs to feed a powered subwoofer. 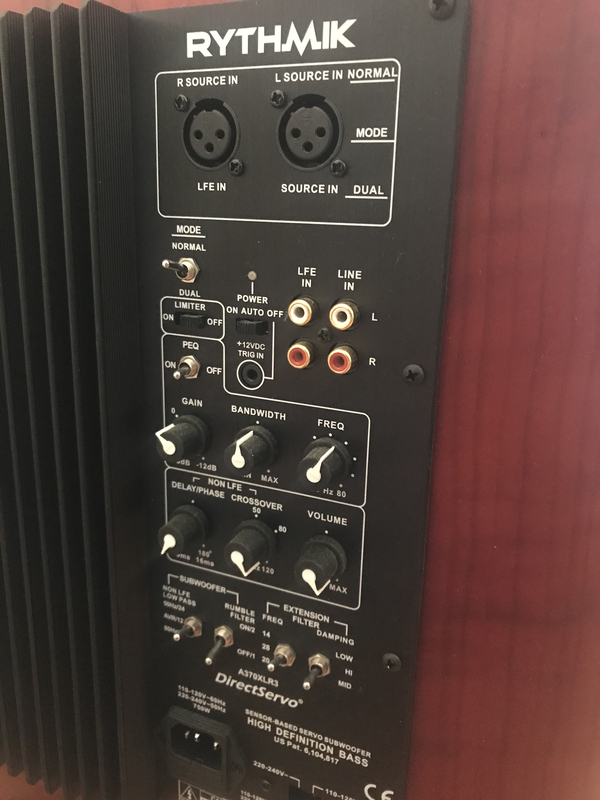 1/Rt = 1/(1/Rm + 1/Rc + 1/Rs) where "Rm" would be the "main speaker plus cable" load (impedance), and "Rc" is the cable impedance running to the subwoofer, and Rs is the subwoofer input impedance. 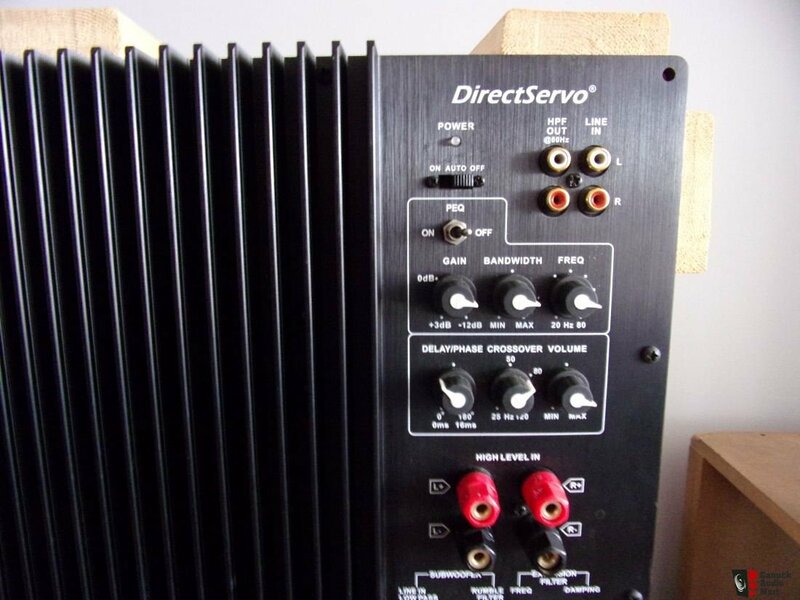 The term there that will have the most impact on the damping factor (DF being defined as nominal loudspeaker impedance load/amplifier output impedance) after the main speakers, of course, being the cable to the subwoofer. I've got no skin in this game (my subwoofer is line-level connected ); I'm just musing, you know? Corollary: Close enough is close enough. Not sure which model GlennDog has but not all Rythmik subs have speaker level inputs. My F8 does not. It depends on what plate amp you ordered with your sub with Rythmik. Some have the speaker level in option and some don't. I ordered mine without, as I do not like wiring my rig up that way. I use RCA out on the MF A3cr amplifier to each sub with zero audible deficiencies whatsoever. @GlennDog, this is what you are talking about doing. Not what F1nut had mentioned doing. Two completely different animals there. [EDIT] - Never mind, it isn't even hooked up. The settings as-is would sound like doggy droppings if they were left like that. FWIW the folks at Rhytmic told me that they recommend using line level. I don't remeber why they told me that. I swore I was gonna wait till I moved to order a pair but now I am temped to get em now so I have something to monkey around with for a while. Tom, I tried line level and high level in my office rig. I definitely noticed improved performance using the high level, it blended better. Getting all technical on us, eh? Well, I have no answer for that nor have I seen it brought up in discussion before. I do know I once had an amp with an ultra high damping factor of 1000 that sounded like crap. However, that was likely due to the excessive amount of negative feedback. I misspoke earlier. My amp has 2 RCA outs. One 4 ohm tap and an 8 plus an XLR. My favorite RCA cable for the subs without going into the ultra high end class of cables is the AQ King Cobra. Brings out the authority with speed and precision better than all of my other sub $500 IC's. It is of my opinion that I need not go any higher or further than those when it comes to the F-25's. You can probably score a set of used for a decent price now. I bought mine when the gettin' was still hot. That was a long, long time ago. Now, if I won the lottery? Perhaps I might change my mind but I feel that there is no reason at all to move up. FWIW, YMMV. Jesse, I observed the same thing when it came to subs I had back in the day (mostly Polk's, Klipsch's, White Van type subs and the like). That all stopped when I started futzin' around with Direct Servo subs. I actually achieve better blending now than I ever did....and this is through RCA. With that said, it does take me (on average) about 3 days to get them right versus 5 minutes with the regular type subs but the end result is well worth the patience and effort (This is mostly due to the amount of knobs and controls offered that wasn't the case with the older subs aforementioned). Drums have the ability to scare the livin' "you know what" out of me now. It hits your body, you can feel it go through your core and as soon as it hits? It's gone. I have actually and literally ducked before on a drum strike. I never achieved that with any regular sub. Ever. The best part about it is zero overponderance when dialed in correctly. Just sheer precision and speed. Right up my alley!!! The two go hand in hand (high DF and tonnes of NFB). But DF specs are like horsepower to some folks, y'know? DF of my 2A3 amp is, maybe about 8. I.e., the output impedance is about 1 ohm, I think. Heck, I guess with the Duplexes, the nominal DF may rocket up to sixteen. No NFB i the amplifier, period. I do have high level inputs on the subwoofer amp I am using, so it is a testable hypothesis. I like those.